University School's Hunting Valley campus is comprised of more than 220 acres of treasured land on the western slope of the Chagrin River Valley. Opportunities for students interested in the natural sciences and ecology abound in this outdoor classroom. Students of all ages regularly use the campus for projects, field studies in science, and other outdoor activities. A number of US graduates have chosen careers in conservation and natural resource management as a result of their experiences at US. Upper School boys study the behavior of local deer and coyote populations on campus using GPS and other technologies to track their movements and feeding patterns. 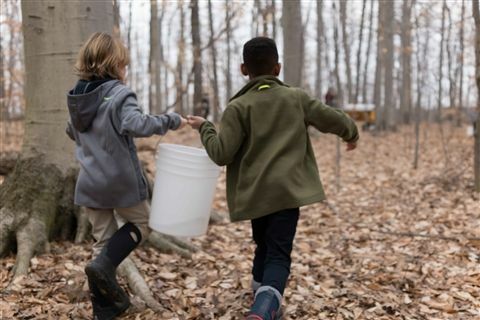 A maple sugaring operation, which has been in existence since 1971, gives students the experience of tapping the maple trees, collecting sap, and boiling it into maple syrup in the school's sugarhouse. Boys study and cultivate endangered brook trout in the school's trout hatchery. Lower and Middle School students help to build replicas of authentic birch bark canoes with many of the same materials, construction methods, and tools used by the Algonquin Indians in the late 1800s. The Hunting Valley campus boasts an astronomical observatory that rivals that of the Cleveland Museum of Natural History. Students participating in US's outdoor programs also work on a variety of projects with local and national organizations, such as the Cleveland Metro Parks, the Chagrin River Watershed Institute, The Trout Club of the Museum of National History, and the National Parks. Warm weather welcomes early maple sugar tapping season on the Hunting Valley campus.